Along with this section "7 Aesthetic tastes of decade", in each chapter as a source of reference, I also created a quick-and-dirty (still a work-in-progress) guide to Furniture Styles. In his 1947 booklet, The Things We See: Furniture, Gordon Russell, briefly -- but insightfully -- sketches out the major furniture design styles that prevailed in England for several centuries. To a greater extent, Russell emphasizes the Victorian, Arts and Crafts, and Modernist periods, which together stretch from the mid-1800s to the mid-1900s. 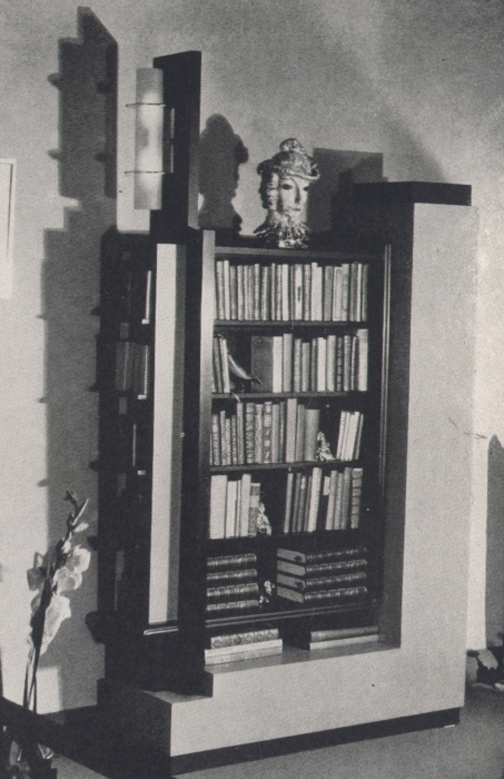 He ends his book with considerable attention to styles of furniture in the 1920s. Gordon Russell's comments (directly below) about the Post-WW I era are important for analyzing the sources of style popular among amateur woodworkers, for what Russell and others claim about "modern" commercial styles slowly become featured in woodworker’s manuals. THEN CAME the war. In countless ways mechanization crept in to provide the goods in the immense quantities necessary. Qua­lity was generally less important than quantity. Men became conscious of the power of the machine as never before, especially as the conclusion of the war merely emphasized that another yawning gap for goods existed. Obviously, the machine must provide the answer. Walter Gropius who set up the Bauhaus in Germany in 1919 to teach experimental methods of designing for the machine, and Le Corbusier with his so often repeated dictum "A house is a machine for living in" expressed the spirit of their age. Defining Modern What is Modern? Among the numerous assumptions that I have realized since beginning this project is how important it is to -- step by step -- define terms, both for yourself, as author, and for the reader. Without definitions, especially in the areas of woodworking and/or of furniture design, soon communication would collapse. "Modern" is one of these terms. ... Today we stand at the threshold of a new era—an era youthful but mature, full in stature and declaring its independence of the antiquated styles of older nations. Ours is the era of the Machine. Machinery is creating our style. It is imposing a new tempo and a new mode of life. With shameful sentimentality we still cling to the outgrown "styles" of the past -- to houses designed in period styles ridiculously alien to their settings; to gilded gewgaws and polished marbles, to pseudo-period furniture. To create works in the tempo of the new spirit means to break with old conventions and to establish new aesthetic values. New materials demand new forms and treatment consistent with their inherent nature. To distort, to mutilate or to disguise the innate essence of a medium in a vain effort to make it conform to conventions of the past, to superimpose upon it some preconceived "style"—this is very denial of any sound comprehension of the meaning of Style. No longer can we turn back to the era of handmade and peasant crafts. It would be silly affectation and hypocrisy to attempt to do so. We must accept the machine. But we must accept it as masters and not as slaves. In the matter of furniture and fabrics. Let us recognize the fundamental fact that the machinery is most suitable, not for reproduction, but for production. Why turn our Tudor chairs with twentieth-century machinery? This is as incongruous as it is artistically dishonest. Machine-made reproductions of handwork, machine-made copies of period styles, are incongruous. Machine-made productions of contemporaneous designs, soundly manufactured in materials of our own day, and intended for mass production, are innately consistent, honest and well built, and in addition, are specimens of a more authentic style than all the copies in the world. Let any sound aesthetician, of no matter how conservative a stripe, refute the essential truth of this fact! Style, then, we may define as the external expression of the inner spirit of any given time. When that expression is the mere aping or borrowing of the spirit of an alien epoch—of any other country, or any other century, but our own, as Gilbert put it—it becomes dishonest affectation. It may assume, but it can never convince. The recent craze for the more extreme atrocities of the Victorian era, indulged in by neurotic and sexless decorators, told us nothing about the Victorian era, but exposed the psychoses of its perpetrators. It was amusing; it was frivolous; it was silly; it was an aberration of idle minds. But worst of all, it was irrelevant. While veritable style lives, it is incessantly changing. Nature knows no style. Her forms are constantly repeated. Trees, ferns and herbs, despite their evolution, maintain their fundamental forms throughout the ages. Style is the symbol of man's creative genius. It is the outward record of his relation to God, nature and mathematics. It is evident in the Assyrian temple, the Buddha of Kamakura, and the Issenheim Altarpiece. In these monuments the style differs, but Style informs all. Change is the life of style. If for generation after generation man repeated the same architecture, the same painting, the same music, his world would be like that of the bees -- the endless proliferation of beehives through eternity. What elevates men, in the last analysis, above the bees is the mastery and the recognition of Style. Modernism has been called the style of reason. Its appeal is an appeal to the intelligence. Its emphasis upon simple forms, its return to mathematical axiom and the fundamentals of form, confer upon it a classical rather than a romantic beauty. Romanticism relies upon associational values, upon the stimulation of suggested memories. By line, proportion and inherent relations, the new classicism makes a direct appeal to the vision and the mind. Modern forms are simple: the square, the circle, the horizontal line, skill-fully and dynamically coordinated—these are a return to the Greek ideal. Their success is due entirely to the correlation and the coordination of elements. If your furniture, your book cases, your desks, your chairs, your dressers, are almost as tall as they are wide; if they tower into the air, but take little space on the floor, it's in the newest note of house furnishings. Decorators ex-plain that the skyscraper idea has necessarily invaded the homes, be-cause of their limited space today. Compactness is the keynote. Paul Frankl, an outstanding furniture designer of the new skyscraper idea, has designed a combined bookcase and filing cabinet, rising in a series of rectangular forms, growing smaller until the top is reached. If I follow the gist of Frankl's claims about "modern", the sense of the new concept of "modern" is revealed in its twofold purpose: (1) to begin with the premise that the lives of humans base are organic, that is, their lives are under constant change, but also at the same time, "stable", i.e., unchanging; and that (2) to be modern is "to make logical use of the products of invention". As a tradition, by consciously ignoring tradition and the expectations which the latter imposes with regard to facade and plan, modernism elects a fresh approach, and frees itself from constraints. Human need comes first, where -- in skillful hands traditional styles discarded, to let new appropriate and beautiful forms emerge from the inside outwardly to express the life within. The term that I believe was the final trigger for my concerns about the necessity of defining terms is "Modern". For example, provocatively, Martin Eidelberg introduces readers to his volume, Design 1935-1965: What Modern Was , dedicated to furniture design from 1935 to 1965 by speculating about what "What Modern Was", that is, thinking about "Modern in the Past Tense". As a term, "Modernity", itself, I think we all agree, "closely linked with a sense of time". "Temporality", that is "time", normally, in our minds we associate with the "present"; occasionally, perhaps, modern is linked to the future, especially Eidelberg argues, "if it carries implications of lasting values". His examples: "Modern is ..." and "modern will be ..." he says are "the standard declensions". On the other hand, when we are confronted with "Modern was ...", are we guilty of a contradiction? For me, I admit, "modern was" is a new coinage. Eidelberg deliberates further on this theme of "Modern in the Past Tense" by noting that "the emergence of the term Postmodern has, if anything, emphasized the curious sense of separation that now exists between us today and that age that we designate as Modern". Our sense of difference -- Eidelberg uses "distance" is temporal, for sure, in that it is the result of a very sensitivity of both how time has passed and the major shift in ideas and values, both public and personal. My 40-year sojourn in the academic world merely reinforces Eidleberg. Just looking at the titles of books on the shelves in my den provides testament to Eidelberg's claims: The First Moderns, The Modern Mind, The Postmodern Adventure, The Postmodern Turn are but a few among several. The term Post-Modern itself was coined both the 1930s and 1950s -- for somewhat different reasons and is something I can document -- as each generation recognized its distance from a previous generation. Postmodern and Postmodernism, in their simplest usage, refers to the period of 20th century marked with the development of atomic weapons and other technological innovations (like television and contraception devices), which, taken together, in Western culture especially, have had a major impact upon human behavior and beliefs. Semantics aside, our goal issue is to understand and explain what really occurred, especially as these terms, Modern and Postmodern relate to an amateur woodworking movement. I found Eidelberg's book, Design 1935-1965: What Modern Was, instructive in that it sets out with both images and text significant artifacts of that relatively short, but explosive -- in all senses of that term -- period. Modern design, in its simplest and most generic form, implies the up-to-date, a current trend, or, better still, a future trend. Many use Modern with a capital M to refer specifically to the period between the early 1920s and the outbreak of World War II: the heroic age of Le Corbusier and L'Esprit Nouveau, the age of Walter Gropius and the Bauhaus. It was the time when the guiding principles of twentieth-century industrial design were forged, the time when an idealistic generation sought to clarify and purify design, to create a language of rational, eternal form. Others might argue that Modern design, even with the capital M, also encompassed the decade and a half after the war, an equally heroic age of artists like Charles and Ray Eames, Eero Saarinen, and Tapio Wirkkala. From the vantage point of the 1990s, the nomenclature and chronology of Modernism take on a certain irony. Can events of three-quarters of a century or even a half-century ago still be termed modern? Ars longa, vita brevis, but can we term designers modern when they have been dead for several decades? Source: Martin Eidelberg, Design 1935-1965: What Modern Was; Selections From the Liliane and David M. Stewart Collection. New York: Harry N Abrams, 1991, page10. The theory of modern design was deliberately simple as a response to the growing complexity of the world. Modernist objects look very different to those that came immediately before them: they have no ornament and no overt reference to historical style and they tend to emphasize materials and processes of constructing. Modernist designers aimed to use industrial processes to create objects with integrity that simplified and dramatized everyday life. Source: Noel Riley: The Elements of Design: A practical Encyclopedia of the Decorative Arts From the Renaissance to the Present New York: The Free Press, 2003, page 420. When the Arts and Crafts style moved to America around 1900, however, and American promoters had to contend with the dictums about handwork vs machines championed by their English counterparts, the use of power machines for manufacturing arts and crafts furniture won out. Old beliefs are not easily changed however; as late as the early 1920s, Barnsley constructed his famous "hay-rake" table -- in the Arts and Crafts style -- our of white oak, using a foot-powered table-saw. (image coming).